“A Simple Gesture” was started by Jonathan Trivers, who lives in Paradise, California. Jonathan is retired and was looking for a way to give back to his community. He and his wife started a not-for-profit to assist the food banks and food pantries in Paradise, California. Jonathan believed that there was enough food in his town to feed everyone, but found that there was no easy way to get the food to the neediest people, Using his professional experience in marketing, he slowly and gradually came up with A Simple Gesture. As the word spread about the program, it was enthusiastically embraced by many citizens. Paradise, California is a small town of 35,000 people and about 14,000 households. There are now more than 1,700 food donors and numerous volunteer drivers who help collect over 132,000 pounds of food in 2014. In addition, over 36 communities across the country have now started A Simple Gesture in their towns. Jonathan spends a lot of time helping communities establish A Simple Gesture in their communities and hopes hundreds of towns and communities will adopt the program. 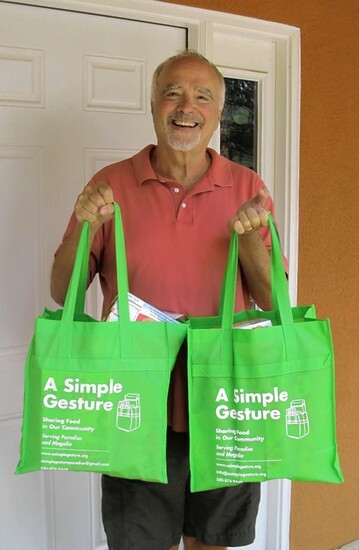 A Simple Gesture-Greensboro has been established as a 501(c)(3) nonprofit and follows the template for food collection established by Jonathan. We believe that both the citizens and the civic community of Greensboro will embrace will also embrace A Simple Gesture as a simple but effective way to try to alleviate hunger in our city. We hope you will consider volunteering as a food donor, volunteer driver, or both! A Simple Gesture is a Simple Idea. Neighbor to Neighbor: Door-to-Door Pickup.